If crochet and laces make you think about your old aunties and their apple pies, this is not the case. Here on MakeTank even macramè can have a digital side and Laura Calligari, with her collections branded Atelier Macramè, it's a living proof of that. Laura is an architect with many passions and one great love: design. In her collections she tests different materials and techniques, to make objects mixing the refined aesthetic of Japan atmosphere with the functionality of nordic design. How did you decide to create Atelier Macramè? Atelier Macramè was born a bit by chance and a bit as a natural consequence of my job. At the beginning of 2013, after a design contest, I felt the need to actually make the project I had created. 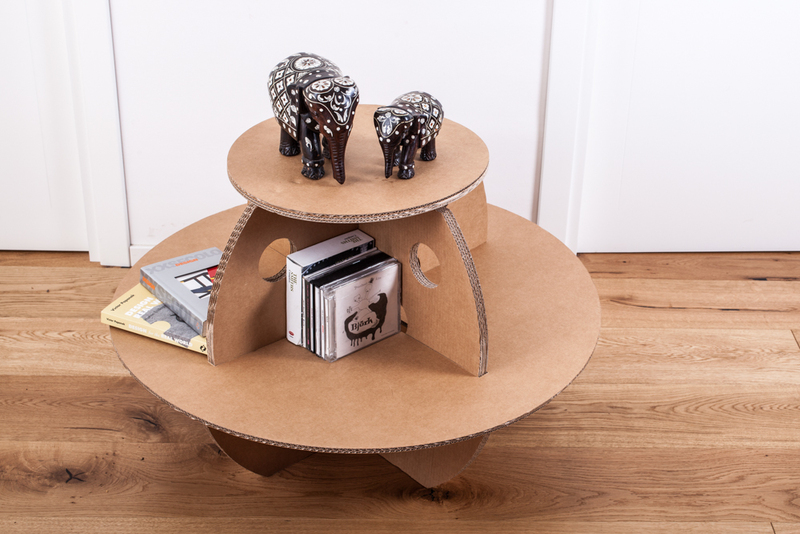 It was Coccinelle, a collection of cardboard furnishing accessories. Cardboard is a material with a great potentiality and many advantages, in many contexts. Without thinking, I put in Atelier Macramè all my background. Event the logo I chose: it seems a lace, and Macramè could make you think so, but actually it's a stylized architectural element which belongs to '900 architecture. 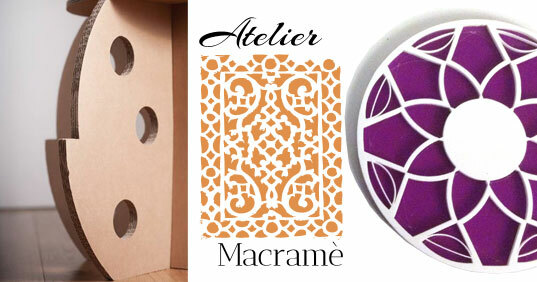 I'd say that Atelier Macramè gathers all my passions, from painting to architecture, and materialize them in design. Your creations mix contemporary design and artistic elements: what are you inspired by? I'm especially attracted by simple and minimal shapes, from decorations and from architecture, which is the key element of my cultural background. I love also to be inspired by tradition and by simple things like dollies, as in my Tricot collection. In the past I designed furniture with traditional materials, like wood. For Atelier Macramè I chose less usual materials, like cardboard for Coccinelle, which is made completely with laser cutting, or PMMA, which I tested in the Trame project and the Tricot collection, again with laser cutting. How would you descrive Coccinelle, in just two words? Versatile and functional. Versatile because you can get three configurations with a single object. You have just to assemble in different ways the five pieces of the set to get a stool, a coffee table or a little shelf. Functional because, in this way, a single object can satisfy three different needs. In the Trame collection, style and simplicity show a marked "Japan" mood: is it something you like? Yes, I'm always attracted by Japan - and, more broadly, oriental - atmosphere. Oriental aesthetic and nordic design are the two nearest cultures to my aesthetic sense of design. What are you working on, now? What are your next projects? I'd like to extend the collections I've already started: the cardboard ones and then Trame and Tricot. 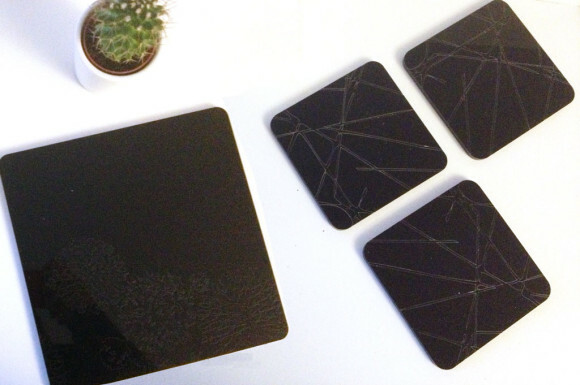 I'm still working with laser cutting to design some daily use objects and a new bijoux collection. I'd like also to test 3D printing: I've already a couple of projects in mind. An Atelier Macramè creation can give a house a bit of…? ...well conceived and refined design to satisfy functional - but not only - needs. Fall into autumn... In style! Arduino blocks your impulsive shopping. Literally.